This dish was made for us a few weeks ago during our trip to Cornwall, we enjoyed it so much that I had to try it once we returned home. This dish will serve at least 3 people with a little left over, depends if you go back for seconds!! While the sweet potato is cooking, heat the oil in a pan and add the onion, fry on a low heat for 3 minutes until softened. Add the mince and brown for 3-4 minutes, then turn the heat back down and add the garlic, ginger, chilli, cumin, turmeric and garam masala, cook for a further 4 minutes, stirring occasionally. Add the chopped tomatoes, mushrooms, peas and beef stock then bring to the boil, then turn down and simmer for 10 minutes until thickened. Remove the mince from the heat and empty into a dish to cool for 5 minutes. 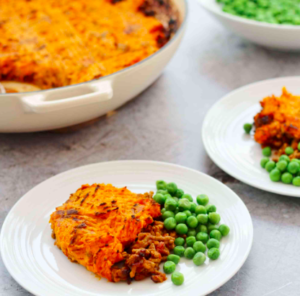 Spread the mashed sweet potato over the mince and top with grated cheese and a little green chilli (if you like a little heat). Place in the oven for 10 minutes until nicely browned on top. While the pie is in the oven, quickly cook your favourite vegetables and serve when ready. Although it takes a little more time and effort this is a meal you must try.